Many business processes consist of rule driven decisions, structured workflows and unstructured case handling. By integrating the OMG standards DMN (decisions), BPMN (processes) and CMMN (cases), you can model and automate such business processes in an end-to-end fashion. 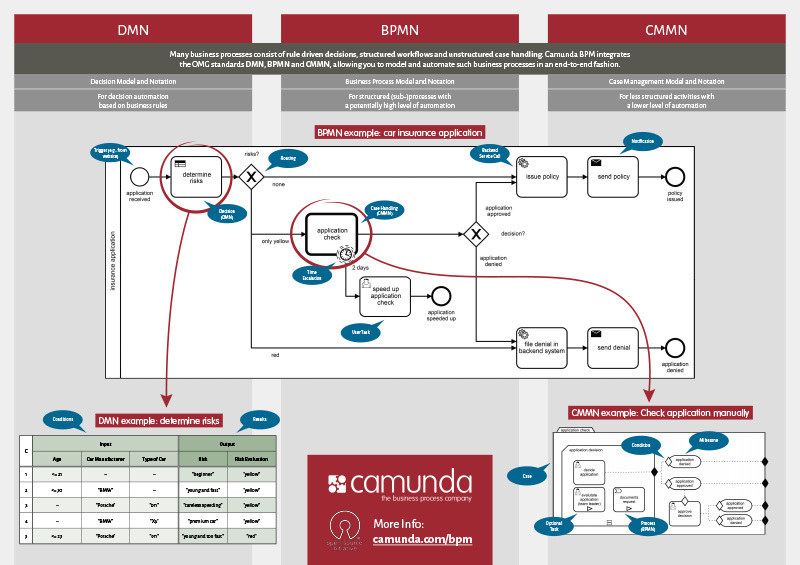 The brand-new BPM poster visualizes this concept with a simple yet practical example from the insurance industry: When someone requests a car insurance, the BPMN process is triggered. The first step is a business rule task that should automatically determine whether we can provide that insurance right away (no risks), need to look at the application in detail (yellow risks) or will definetely refuse (red risks). The detailed application check is a CMMN based case with different possible actions and performed by a knowledge worker, whereas the risk determination is a fully automated DMN decision table. We will send you a copy of this poster (594mm x 841mm) completely free of charge!